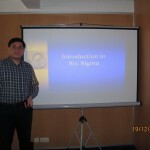 Introduction to 6 Sigma training for yellow belt candidates. ‘6-Sigma’ is a disciplined and customer voice oriented, fact-based approach with a series of tools &methods to managing a business and its processes including production and/or design of products, processes, and/or services, aiming to reach to a higher quality level. Zerobuffer provides risk management and project planning from small to large-scale projects with an arsenal of highly skilled developers from diverse domains. It also provides organizations with services that are essential to success on complex Java projects. Although it is new to market, Zerobuffer has already worked with a broad range of clients all around the world.